PPM Global’s heap leach support services have improved mineral extraction efficiencies, of heap leach or leach pad projects around the world. A leach pad is defined as a continuously lined area which may contain one or more ‘heaps’. 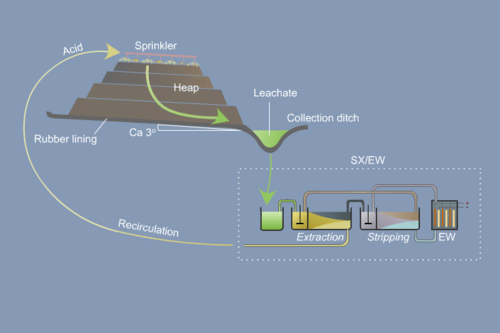 The irrigated solution (raffinate) averages approximately 1-2 g/L of copper and 20 g/L free acid. 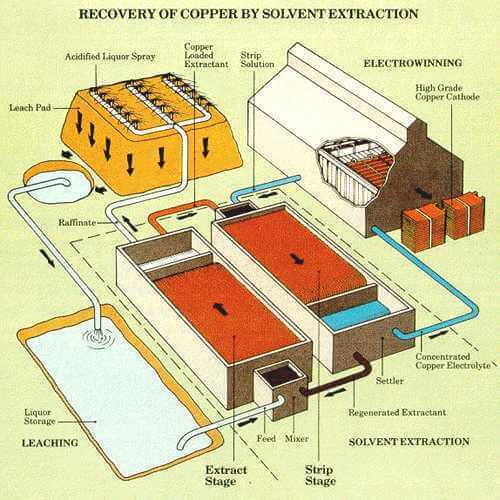 The solution discharging from the heaps, pregnant leach solution (PLS) will vary in copper concentration over the life of the heap, initial grades may be as high as 50 g/L of copper. Heap leaching technicians might only get PLS grades only fractionally greater than the raffinate irrigated after raffinate has been circulated a number of times. Air is forced into the heaps via a network of pipes located 1m above the base of each heap. The target minimum air flow rate for heap leaching is one meter cubed of air, per one meter squared of leach pad area, per hour (1.0m3/m2.Hr). The air provides oxygen to both the organic and inorganic reactions for better heap leaching. Within limitations, increasing the amount of airflow into a heap leaching project will increase the temperature within the heap. Conversely increasing the flow of raffinate to the ore will reduce the temperature of the heap. Design of new heap leaching circuits. Heap leach test work scope development. Heap leach commissioning, and consulting assistance. Heap leach training services requirements for minerals leaching process personnel. Phone our expert heap leaching consultants today to discuss how PPM Global can assist you with heap leach support.